If you’ve been looking for an ultra secluded vacation rental with ocean views and gorgeous, tropical gardens, you found it! Enjoy the ocean view while swimming in the pool and make a cocktail at the swim-up bar. The kitchen is, fully equipped with the best appliances and cookware, and the media room downstairs has everything you need for movie nights. Each of the bedrooms open to their own view of the sea, and there’s accommodations for adults and children alike. 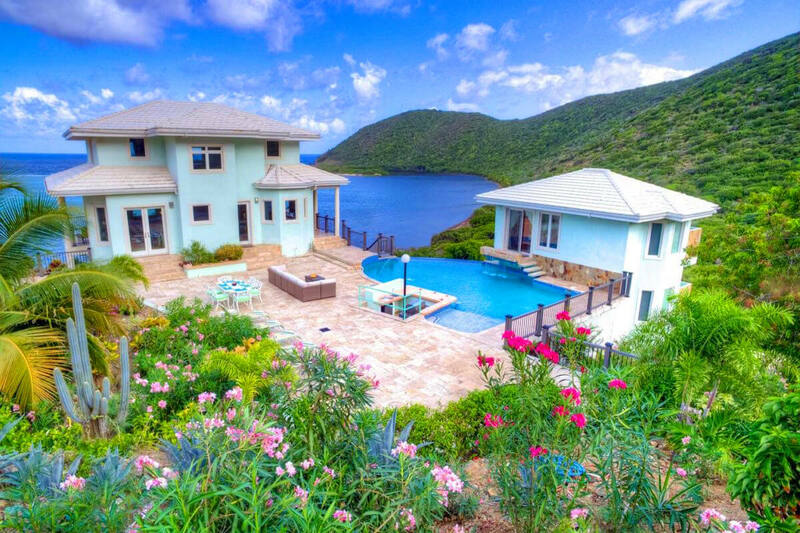 Anam Cara Villa is a peacefully private vacation home located directly along the coastline of Little Bay, Virgin Gorda. Little Bay is part of a BVI-designated marine sanctuary, so this home is perfect for travelers who want to unwind in tranquility. Anam Cara has a dozen decks and balconies, and each has its own stunning tropical view. Some look directly into the sea, and guests may be lucky enough to spot sea turtles and fish from their balcony. Gorda Peak National Park surrounds the villa, so there’s gorgeous island views from every side. There isn’t any development around the property, so guest can relax around the deck and swim in the saltwater pool in total seclusion. The pool has a waterfall and remote-controlled fiber optic lighting for late night swims. The sunken bar has a mini fridge, gas grill, and wide countertops for mixing cocktails and preparing snacks, and there’s al fresco dining, a large sectional, and loungers on the deck. This fully air-conditioned home has tropically modern architecture spread over two buildings, both of which are designed for seamless indoor/outdoor living. The main floor’s large gourmet kitchen opens to the deck and has a pass-through window connected to the outdoor dining space. Stainless steel appliances, an indoor breakfast bar, and a dining table furnish the kitchen. On the lower level, guests can watch movies and hang out in the media room and lounge. Anam Cara has five bedrooms, and each has an ensuite bathroom. Three master suites are spread throughout the main house and poolside apartment, and each has a king bed and large spa bathroom with both an indoor and outdoor shower, double vanity, and a soaking tub. There’s one master suite on the lower level of the main house and two in the poolside apartment. The main house’s upper level holds a twin suite and a king suite that can be made up with two twin beds. Both have a balcony and ensuite bathroom. Anam Cara is a short drive from the North Sound, which has free water taxis to take guests to restaurants, resorts, and yacht clubs. This villa is perfect for families and friends that want to relax in paradise. Rates do not include: tax of 10%, island charges of 12%. Airport transfers are not included, but can be arranged for a fee.